The most vulnerable synapse: historic aspects of neuromuscular junction disorders. Reliability of neuromuscular transmission and how it is maintained. The neuromuscular junction. 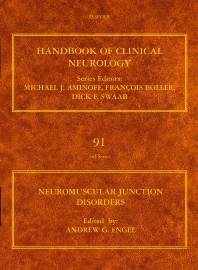 Electromyographic aspects of neuromuscular junction disorders. The immunopathogenesis of myasthenia gravis. Autoantibodies in different forms of myasthenia gravis and in the Lambert-Eaton syndrome. Clinical features of myasthenia gravis. Therapy of myasthenia gravis. The Lambert-Eaton myasthenic syndrome. Congenital myasthenic syndromes. Botulism. Neurotoxicology of neuromuscular transmission. Organophosphate and carbamate poisoning. Peripheral nerve hyperexcitability and the neuromuscular junction. This volume provides concise and comprehensive information on neuromuscular disorders, including rapid advancements in the understanding of the neurobiology of neuromuscular transmission. In addition, clinicians will find timely discussions on the various forms of these disorders that have been discovered due to increased study within the field. New observations into the immunopathogenesis of myasthenia gravis, and the molecular mechanisms underlying the links between activity and patterns of gene expression, particularly in muscle, are also explored, along with novel information on the understanding of the pathophysiology of the heterogeneous group of peripheral nerve hyperexcitability syndromes. Each of these valuable insights, and their accompanying explanations, provides a framework on which new therapeutic strategies can be built to aid in the enhancement and restoration of normal function in neuromuscular junction disorders.